We're looking toward Birkenhead, across the Mersey--or, more precisely, the stretch of the Mersey called the Narrows. The mud hints at the river's 30-foot tides, not a plus if you're eager to build a great port. 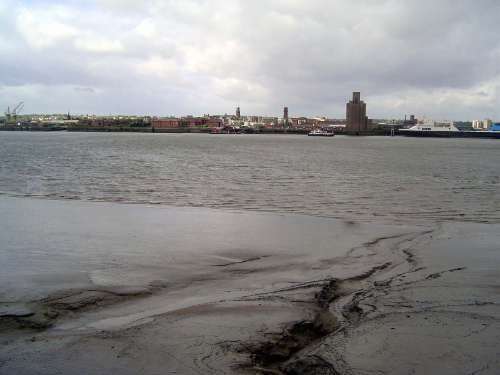 Before the rise of Southampton, say about 1920, liners docked at Liverpool's famous landing stage, now gone. It was a floating platform that rested on 200 pontoons and stretched along the Narrows for 2,478 feet. Merely awkward for passengers, this arrangement was unsatisfactory for freight, which in those days wanted to move between ship and warehouse with as little handling as possible.